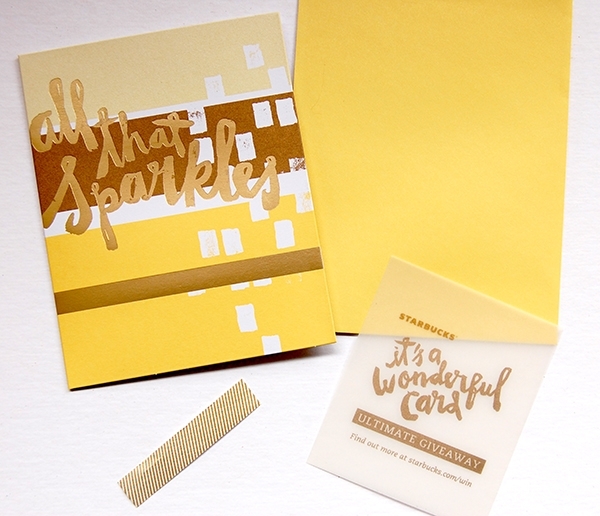 Let’s talk package design this #DesignDecember. What better way than with a Starbucks Haul! I’ve always been impressed with the marketing strategies and ad campaigns Starbucks produces through the year, Christmas being my favorite. 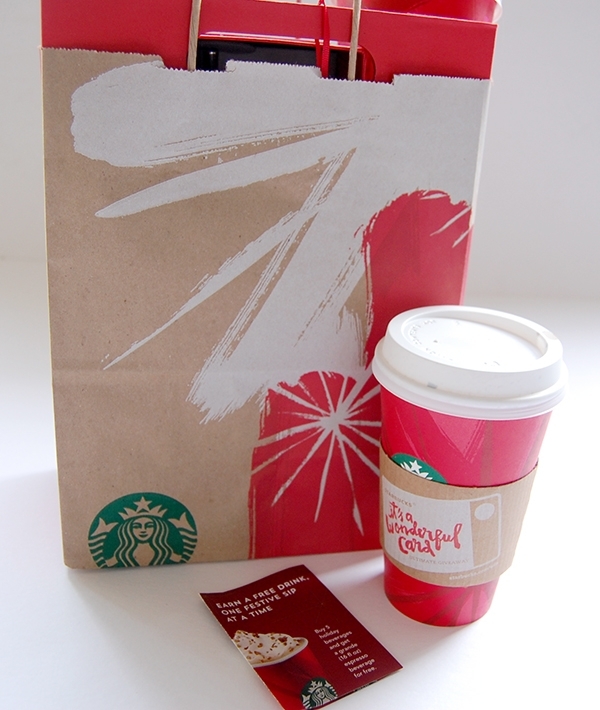 The Starbucks stores literally turn RED for the Holidays. 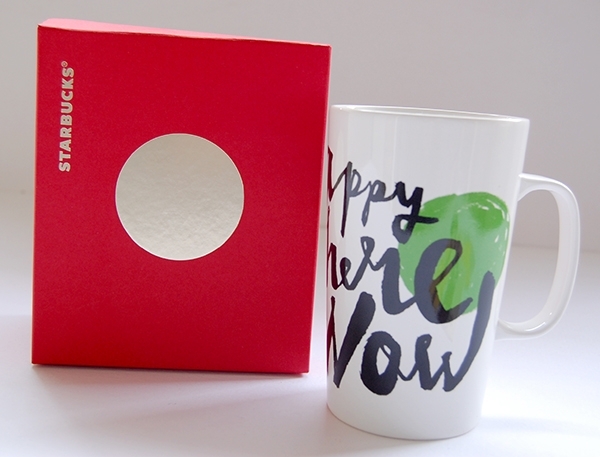 2013 DieLine wrote a Q & A article with Terry Davenport, Senior Vice President, Global Brand and Creative Studios, about the red cup strategy. 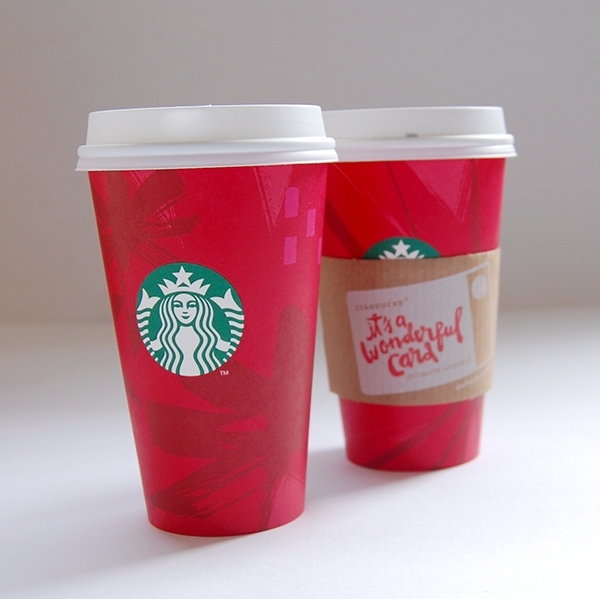 Seeing the red cups, for me, is the official start of Holiday celebration, socializing, coffee/tea breaks. If you are paying any attention to social media, you would seen the buzz of sharing red cups on instagram, youtube, twitter and other social channels. 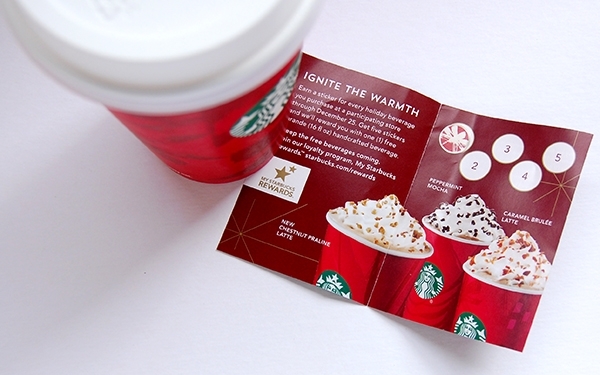 Kudos to Starbucks for LISTENING to the social buzz of their brand. Did you catch the buy one get one free day earlier this season. The Meet Me to Share Some Joy campaign? As a way to encourage Starbucks lovers to buy, you can earn a free grande after 5 purchases, which I’m sure came easy for some, but also, it opened up doors to NEW customers with buy a drink and share with a friend. If you go into most Starbucks today, you will see they have remolded the interior to be more social and work friendly by adding seating that accommodates those on laptops and mobile devices. Again, Kudos to Starbucks for LISTENING. Over the years, I’ve notice how Starbucks has developed cohesion around their campaigns. Here you see the gift bag and box are the same. (Notice the circles). 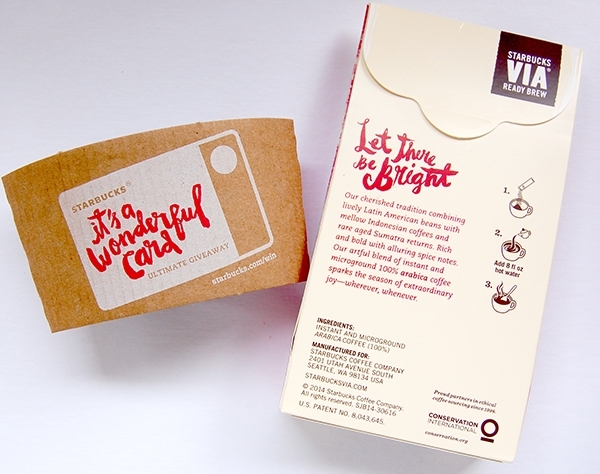 Earlier this year Starbucks did the same with their Brezza Bright & Herbal line. 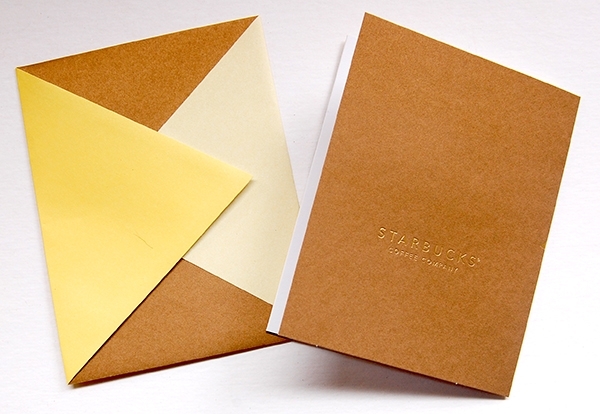 The products were a direct reflection of the Brezza coffee packaging. I love typography and a huge fan of hand lettering. When I saw the font choice for the packaging this year, I imagined an artist with a paintbrush in hand, writing a letter to a friend. If you are on Pinterest you can find similar font styles. 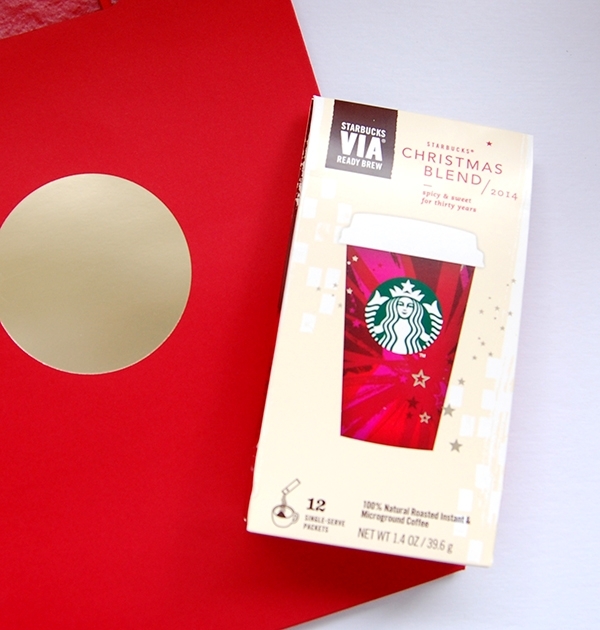 Though this gift I chose did not have the Starbucks signature red, it did have the font. Still making the product a Starbucks product. How’s that for branding? Be sure to check out the Starbucks For Life video. 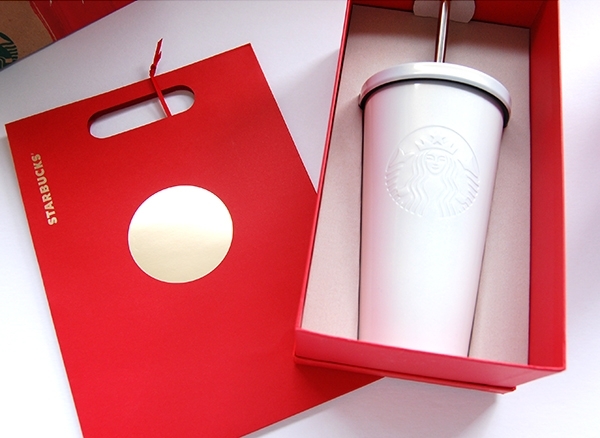 Take a look at the Starbucks Magic Christmas Cup app. For your listen enjoyment, Auld Lang Syne Starbucks style. I do have a small obsession with Starbucks…..